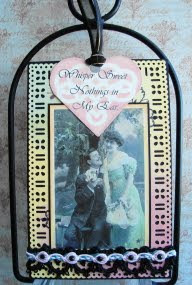 Vada's Blog Stamp Inks and Paper : Whisper Sweet Nothings My Valentine. 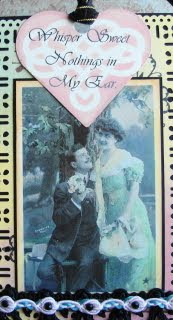 Bella Creations Tag Challenge is “Oh La La”, using this photo. to come join Bella Creations and join our challenge. Thank you for stopping in today, hope everyone is staying warm today. wear your “Green and Gold” proudly…. Labels: Bella Creations, Oh La La Challenge. Oh La La, Vada! Love what you did with this image! Gorgeous tag! You stay warm and best have two of those beers to keep you warm and a nice cheese hat! Have a great weekend!